WATCH What is a 'frost quake'? Cryoseisms, also known as "frost quakes" or "ice quakes," may have been the reason loud booms and banging sounds were reported in the Chicago area, where brutally cold, below-zero wind chills have taken over. The "frost quake" weather phenomenon occurs when the ground is saturated with water or ice. Right now, that's the case in the Midwest, where many spots were recently covered with snow that then melted into the ground. When there is a rapid drop in temperature, that saturated ground will quickly freeze. 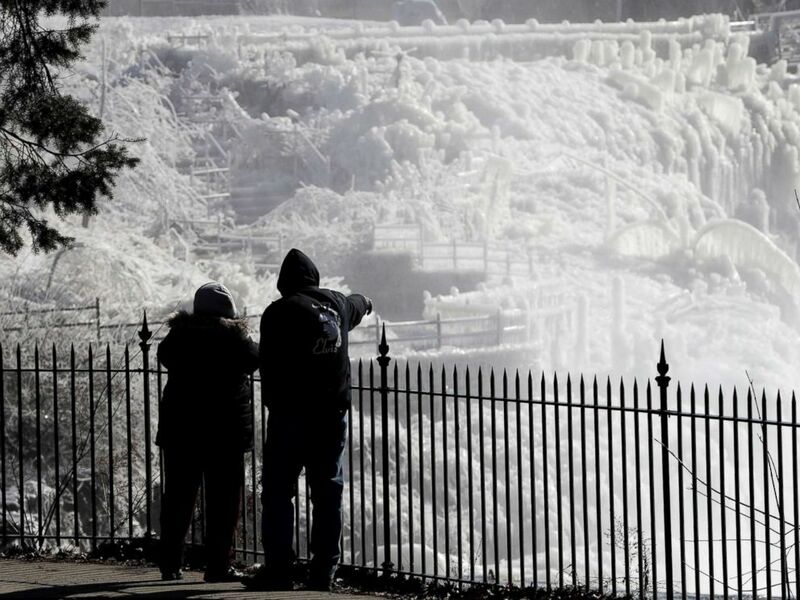 Ice is seen on the side of the Great Falls National Historic Park as a couple takes in the sights during a frigid winter day, Jan. 30, 2019, in Paterson, N.J.
As that water underground suddenly freezes into ice, it then expands, causing the surrounding soil and rock to crack. The cracking is what produces the loud noises -- or the "frost quake." All of the ingredients were certainly there for "frost quakes" to occur in the Midwest Wednesday morning as wind chills plummeted well below zero. The wind chill in Chicago clocked in at minus 52 degrees. The wind chill reached minus 55 degrees at the Minneapolis–Saint Paul International Airport. Frost quakes were reported in Pennsylvania this week, according to WHP in Harrisburg, and in the Indianapolis area last week, according to WISH-TV. What is a 'frost quake'?